Make sure you’re leveraging the latest advances in stroke care for your patients. This practical, evidence-based stroke care resource reviews the latest research, recommendations, and opportunities in the diagnosis and management of stroke. Emergency clinicians are on the front lines of stroke care every day, and with the breathtaking speed of progress in diagnosis and management of this disease, you need to know how to manage patients according to the latest and best evidence. Expanding opportunities for IV rtPA use in acute stroke: What is the very latest in expanding the time window? What is its use in minor stroke and rapidly improving stroke symptoms? What are the contraindications for IV rtPA? Update on advanced acute stroke imaging: What is the latest research on CT, CTA, CT perfusion, and 4D CT? What are the concerns and limitations of multimodality neuroimaging? Endovascular therapies for acute ischemic stroke: What are the recommendations following the most recent trials on mechanical thrombectomy with stentriever? A full analysis of the latest evidence on this major paradigm shift in stroke care. Update on stroke systems of care: What are Acute Stroke-Ready Hospitals, and how do they fit into your hospital’s practice? 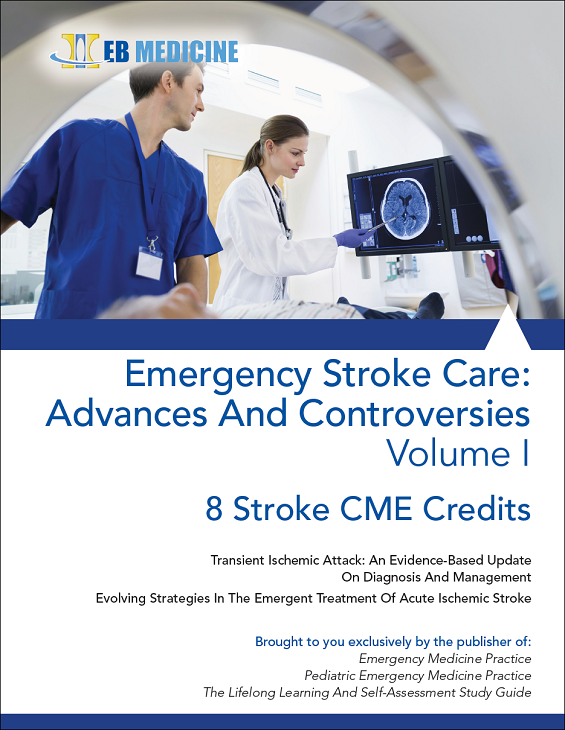 The most current Joint Commission guidelines, and information you need on how stroke certifications affect practice in your ED are covered. Is the ABCD2 Score still the best risk stratification tool? Echocardiography, CT, or MRI – which is the best choice for imaging? Great book. I will use TPA and CTA more often.